When Meghan Mahanta, M.D. was growing up, she dreamt of touching the sky as a pilot or diving in the water as a marine biologist. But, with each new path she thought about, it seemed something was missing. That something, turns out, was helping people, specifically kids. She wanted to make a difference in people’s lives and realized the best way for her to do that was on the ground, as a pediatrician. 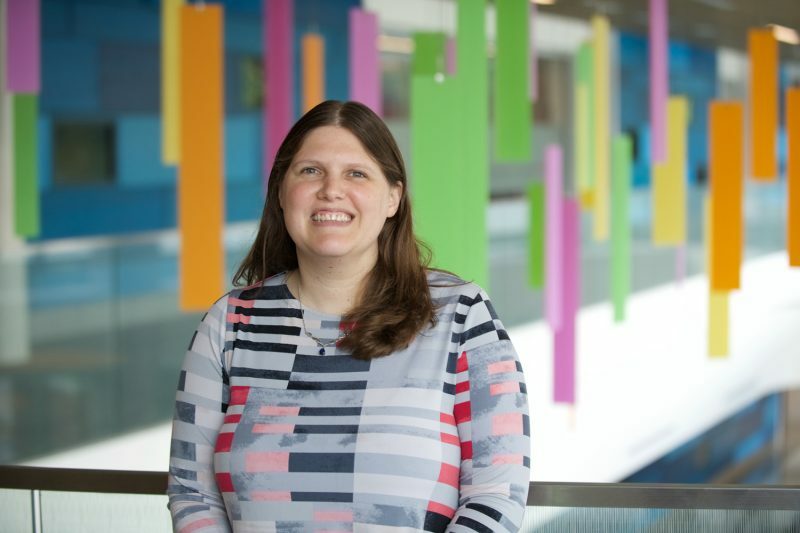 Today, Dr. Mahanta is right at home as a pediatrician at Akron Children’s Hospital Pediatrics (ACHP) office in Fairlawn where she gets to help kids navigate through childhood – from infancy to teenager years – and all the growth, development and conditions that come along with the journey. A: Smiley face with heart eyes when I text my husband. Q: What did you eat for breakfast? A: On days that I work, I always have a bowl of cereal because it is quick and easy. However, breakfast is my favorite meal of the day so on the weekends I go all out with pancakes, waffles, bacon and eggs. I also enjoy “breakfast for dinner” night! Q: When you curl up on the couch to watch a movie, are you most likely to have a bowl of popcorn, chocolate or box of tissues? A: Definitely popcorn. I can’t watch a movie without it. I also will sometimes eat popcorn with chocolate chips to get a sweet and salty combination. Lately, the only movies playing in our house involve Disney princesses per my daughter’s request. 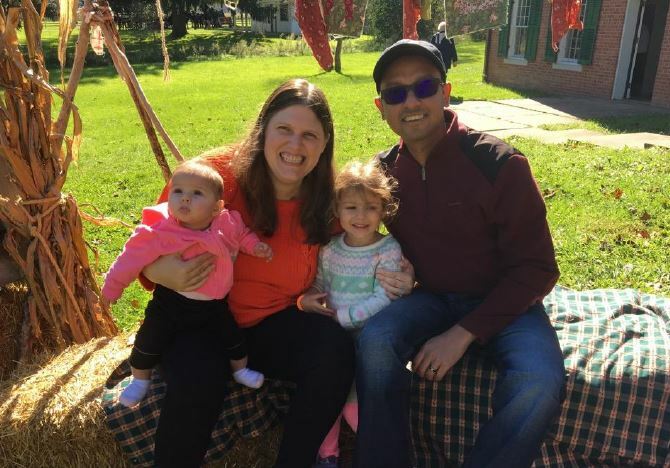 Dr. Meghan Mahanta with her family: husband, Nayandeep, and daughters, Rilynn (3) and Adelynn (7 months). A: Take a nice, hot shower. I don’t feel like I am fully awake if I haven’t showered. Q: What piece of advice did someone give you when you were young that still resonates with you today? A: Do not go to bed angry. I got this advice from my grandparents and they’ve been married for 50+ years so it must work! A: Shaker Heights, OH. I left the area for almost 10 years, living in Arizona and then Minnesota. I decided to come back home to Ohio to be near family now that I have a family of my own. I also love being back in a place with seasons, particularly fall, which is my favorite time of the year. I’m excited, too, that I’m close to Columbus so I can get to an Ohio State football game! Q: Who makes up your family? A: My husband, Nayandeep, and two daughters, Rilynn (3) and Adelynn (7 months). We enjoy playing outside in the backyard or going to a nearby playground. A: A pilot and marine biologist were my top two. We travelled a lot when I was younger for my dad’s job. I was really fascinated by airplanes and would always ask to go in the cockpit. I decided on pediatrics because of my love for kids and felt it was a better lifestyle for raising my own family rather than travelling all the time. I’m still hoping to one day get my pilot’s license, though! A: Ohio State. I went there for medical school so I am a big fan. Go Buckeyes! Q: Have you ever met anyone famous? A: I met Bill Nye the science guy while I was in college at Cornell University. I have his autograph but didn’t get a picture with him. Can a helmet actually reduce the risk of concussions?